Those wondering if I will ever stop singing the praises of Blood and Bone better not hold their breath. As far as I’m concerned, it is the preeminent American made martial arts film of recent years. To my dismay, the DVD contained scant supplemental materials. Fortunately, interest in this little gem has only grown in the two years following its release. 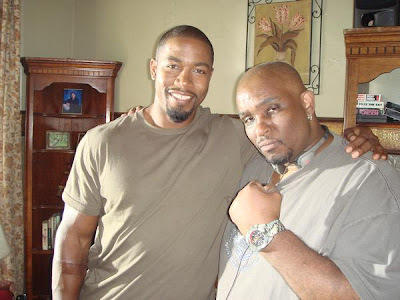 Star Michael Jai White and director Ben Ramsey continue to be asked about it. Thankfully, they are always game to accommodate adoring fans such as myself. Last week, the film screened in New York City's Museum of the Moving Image as part of their ‘Fist and Sword’ Series. Michael and Ben were in attendance. They stuck around afterward for a nice little Q&A that was moderated by none other than Warrington Hudlin. They discussed the enduring popularity of Blood and Bone, as well as the possibility of a sequel. The clip is in two parts and lasts less than 20 minutes altogether, so there’s no excuse not to partake. Enjoy! *Thanks to Shadow and Act for the scoop! I also would love for Matt Mullins to do a spinoff where he is Price again but as the hero kind of like how Uri Boyka went from villain to Hero in Undisputed 3.